Chairman Michael Johnston says his abstention from voting against a newco Rangers was to reflect the views of Kilmarnock fans. 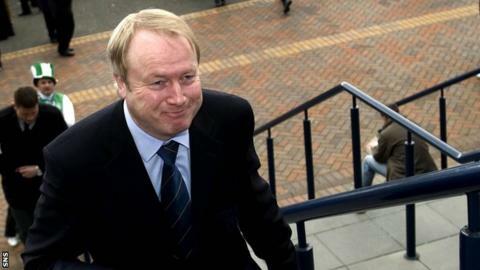 Johnston has attracted flak for his stance as the Scottish Premier League rejected the newco's application. But he claims that only 36% of nearly 2,500 canvassed shareholders and season ticket holders backed a 'no' vote. If the SPL cannot function without four Old Firm derbies, then the SPL should have come up with a solution rather than passing the buck to the SFL. Johnston also cited his "fiduciary duty as a director to act in the long-term interests of Kilmarnock". Wednesday's SPL club ballot went 10-1 against admitting the newco into the top flight, with Rangers in favour and the Rugby Park outfit abstaining. "I elected to abstain in order to reflect the result of the consultation process and in recognition of a number of other factors," said Johnston via a statement. He added that his choice was "symbolic" since he knew it would have no influence on the outcome. Rangers now await the result of a Scottish Football League vote on 13 July, which is expected to determine whether they begin again in Division One or Division Three. However, Johnston is critical of the SPL's handling of the affair. "I believe the plan to parachute Rangers into SFL1 is highly controversial and wished to register my concern about the timing of the SPL vote and the resultant pressure now placed on the SFL," he added. "If the SPL cannot function in its present form without four Old Firm derbies, then the SPL should have come up with a solution rather than passing the buck to the SFL."